A first release of the project will be available to download in the coming months. Reddit user MC_Pitman has spent the past year revamping terrain generation in Minecraft and, judging by the results in the image above (make sure you click in the top-right to go full screen), it's time well spent. 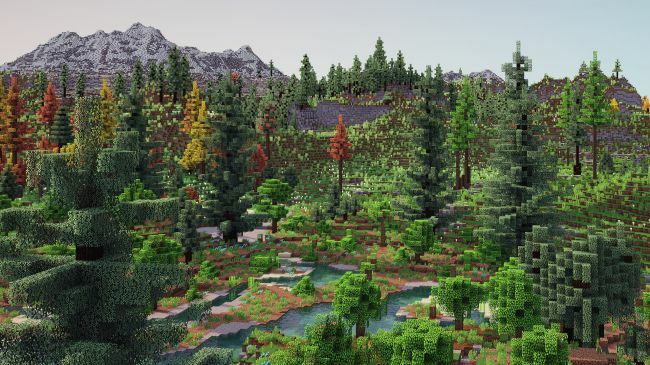 The aim of the project was to make terrain regeneration look “more natural and realistic…more like a generated landscape than a bunch of individual biomes”, they said on Reddit. They've built a big world with a number of zones—the one you see above is the Alpine climate zone, which MC_Pitman says is the “most polished and complete” sector. The way the different environments meld together is gorgeous, and I'd love to build a house atop that hill in the centre. A first release of the full world will be available “in the next few months”, they said. MC_Pitman is also the creator of Biome Bundle, a popular custom world generator with more than 400 original biomes. You can view pictures of it in action here.